Evanston police chief Richard Eddington. Eddington said he will be retiring at the end of December. Richard Eddington wanted a job that let him do “something different everyday.” He wanted spontaneity. He wanted the unconventional. He did not want a desk job. So he chose police work, and from 1974 he rose through the ranks in nearby Roselle: detective, sergeant, lieutenant, captain and chief. He then served as police chief in Mount Prospect from 2001 to 2007 before moving his career to Evanston. During his roughly 12 years with the Evanston Police Department as the police chief, Eddington helped revive a beloved community program, handled former President Barack Obama’s 2014 visit and implemented body camera requirements following outrage over the 2015 arrest of Northwestern graduate student Lawrence Crosby, who was accused of stealing a car that was his own, then arrested by EPD officers for disobedience. More than 44 years since he first began police work, Eddington will be retiring from the field in December. 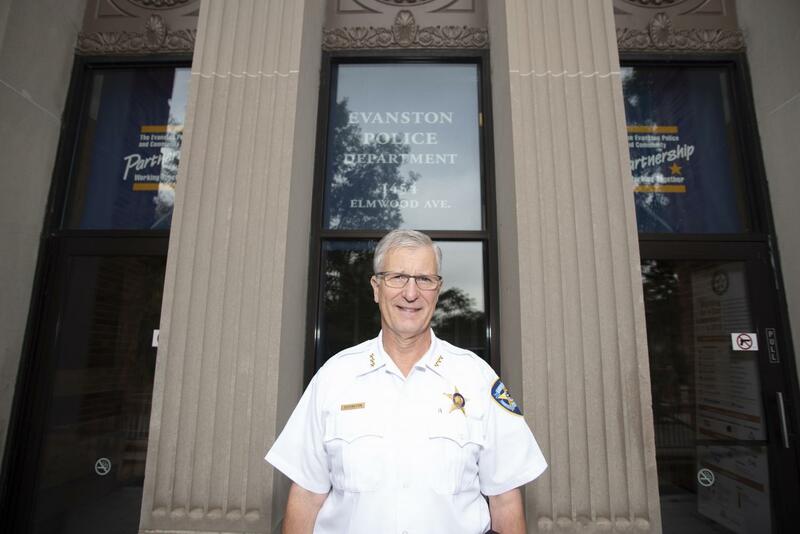 While the lake may have called Eddington to Evanston, he said he was hired as police chief in 2007 because then-city manager Julia Carroll believed his veteran police experience would help the department. However, Eddington faced a different dynamic in coming to Evanston from Mount Prospect, where only 2.7 percent of the nearly 54,000 residents are black. According to the U.S. Census Bureau, Evanston has over 74,000 residents, 17.2 percent of them black. Crosby’s arrest again brought to the surface tension between Evanston’s black community and the police. The incident spurred policy changes within EPD under Eddington, including changes to officers’ training, alterations to the complaint process and increased transparency in terms of data released to the public, The Daily reported in 2017. The department also required all on-duty officers to wear body cameras beginning in January 2018. Crime also largely decreased during Eddington’s tenure as police chief, city manager Wally Bobkiewicz said. Since 2007, Evanston’s crime index has declined nearly every year except for 2012, when it stagnated, and 2017, when there was a 4.9 percent increase in overall crime. Bobkiewicz also applauded Eddington’s efforts to reflect Evanston’s community by hiring more officers of color. He said Eddington routinely encouraged officers to engage with residents, urging them to step out of their patrol cars and get to know people. Internally, Eddington was known as a “fair” and “down-to-earth” individual, Evanston police officer Enjoli Daley said. Daley said she has a lot of interaction with Eddington, including one-on-one meetings. She said Eddington has an open-door policy and welcomes ideas, a trait not found in all leaders. For example, although he was on the fence about restarting EPD’s Explorer Program — which aims to teach high school students about careers in law enforcement through hands-on activities — Daley was able to convince him after presenting more concrete curriculum information. The hunt for Eddington’s replacement has already begun, Bobkiewicz said, and five or six likely candidates will come to Evanston for panel interviews in mid-November. Earlier in October, Bobkiewicz held a community meeting to gauge what residents hope to see in the next police chief. He said there was a common answer: Community members asked for a chief who is flexible. At 66 years old, Eddington said 60-hour work weeks are difficult, and he wants to go out “at the top of (his) game” rather than experience any decline in his performance. Still, he may not leave police work completely. Several firms that specialize in law enforcement functions have sent him job offers. “I’ll listen to what they have to say and decide whether or not I want to do that — or just go fishing,” Eddington said.